Our product range includes a wide range of inking rollers. We are an esteemed organization engaged in manufacturing and supplying a wide range of Inking Rollers. The range of our inking rollers encompasses a number of zones arranged in the way of the axis of rotation. Further, we develop these rollers in varied specifications and with other important features. 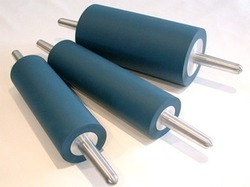 Clients can avail these rollers at market leading prices. Looking for Inking Rollers ?